Mary Pickford was the most popular woman of her day. She was "America's Sweetheart," and millions of fans around the world called her "our Mary." Her rise to unprecedented global fame coincided with the rise of popular cinema, and during those early years of film, Mary Pickford was its most adored and dynamic star. Mary Pickford, "the Girl with the Golden Curls," was born Gladys Louise Smith in 1892, in Toronto, Canada. She was the eldest of three children born to John Charles and Charlotte Smith. Her father had a hard time holding a job and the family's financial circumstances were, at best, uncertain. Though it was not something the family admitted, it appears that John suffered from alcoholism. When Gladys was just three and her siblings still infants, their father moved out. Three years later, in 1898, he died of a cerebral hemorrhage. Pickford would later write, "I can close my eyes and still hear that scream of Mother's at the moment Father passed on." His widow and three children were left with nothing. That same year, anxious to help support the family, Gladys made her theatrical debut. She played the role of a fatherless child in a typical melodrama of the day, The Silver King. Right from the start she possessed something indefinable that attracted the audience: star quality. She and her mother, Charlotte, built on this success to win more jobs and began a life on the road in touring shows. At age 15, Gladys went to New York to break into Broadway. Gladys had set her mind on working for a famous producer, David Belasco, one of the great theater impresarios of the day. She spent weeks waiting outside his office for an interview. One day, facing yet another refusal, Gladys became strident. Hearing the outburst, an associate of Belasco opened his door. Gladys marched in the office and declared, "My life depends on seeing Mr. Belasco!" Her tenacity -- and, no doubt, her beauty -- won her an audition. Belasco offered Gladys a part in a production called The Warrens of Virginia. He recommended she adopt a new, more star-like name, and Mary Pickford was born out of a surname from her mother's family and a lie about her middle name: hating the name Louise, she told Belasco her middle name was Marie, then adapted it to Mary. In 1909, after Mary had performed for a year in A Good Little Devil, the show folded. 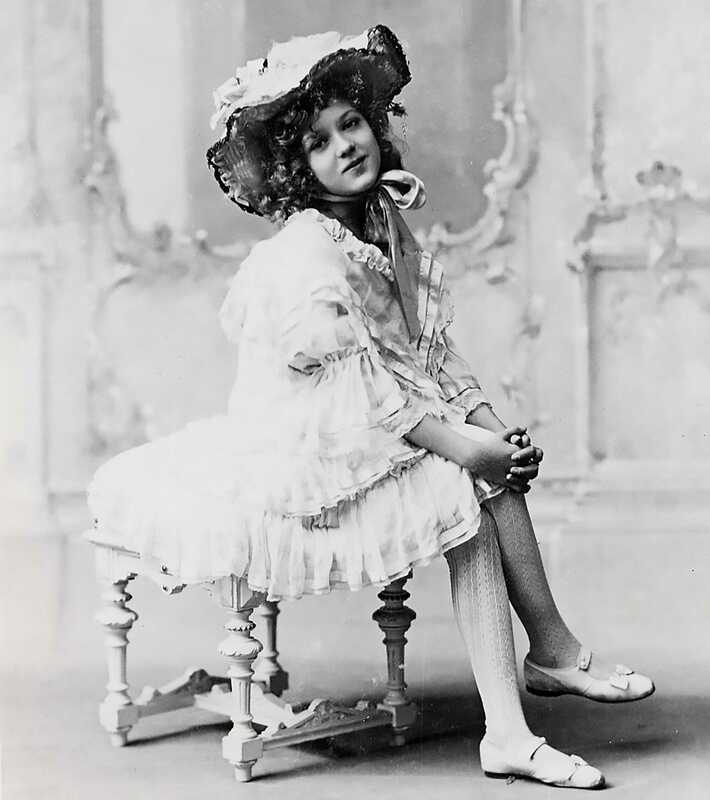 Pickford was nearly 17, an awkward age in her profession: she was too old to play a little girl, but too young to take on the role of leading lady. She wished to continue working for Belasco, but there were no prospects for future roles. Pickford grew anxious and turned, on her mother's advice, to the very last resort for actors of the day: the movies. She hoped the shift would be temporary, and that she would soon be back on Broadway. Reluctantly looking for work in film, Pickford again went to the top -- to the well-known director D.W. Griffith and his New York film company, Biograph. She had a disconcerting screen test, and an awkward encounter with Griffith, but he was attracted by her beauty, by her tumbling blonde curls, and by the "intelligence which shone in her eyes." He offered her five dollars a day, three days a week. She challenged his proposal, demanding ten dollars a day (nearly $200 in 2003 dollars) and more for extra work. He accepted. The actress was as innovative as her director, and together the two experimented with new methods of filmmaking. Pickford quickly understood that a new style of acting was required for the movies. She toned down her performances to make them more intimate; she expressed emotion through her eyes, not with grandiose gestures. Audiences responded to Pickford's performances and began to identify her as the "Biograph girl." With her mother's encouragement, Pickford moved from one company to another, always negotiating higher salaries. Finally, in 1913, she made a deal with Adolph Zukor, joining his Famous Players Film Company for the grand salary of $500 a week (over $9000 in 2003 dollars). In her fifth film for Famous Players, Tess of the Storm Country (1914), Pickford played a poor but heroic young woman, Tess, who makes the noble decision to care for a baby born to an unwed mother. Her performance vaulted her to extraordinary heights of stardom. To the astonishment of Mary and Charlotte, her popularity kept growing as Cinderella (1914), Rags (1915), and Madame Butterfly (1915) followed. The journalist Adela Rogers St. John would later describe Pickford as "the woman who was known to more people and loved by more people than any other woman that has been in all history." Her career at the top would also last longer than almost anyone in Hollywood history -- for more than a decade, until 1927, her box office numbers would hit all-time highs. While Pickford was soaring to the top, her personal life was in tatters. When she first started working at Biograph she had fallen in love with a handsome actor, Owen Moore. They were married in 1911. Pickford knew that Charlotte did not approve of Moore from the beginning, so initially she concealed her marriage from her mother, and her public. Soon Moore's temper and alcoholism surfaced, and as Pickford's career took off, her marriage fell apart. It was during this tumultuous period that Pickford met and fell in love with the dazzling, handsome film actor Douglas Fairbanks. Fairbanks was the polar opposite of Owen Moore: he was full of energy and optimism, had a charismatic personality, was a brilliant and ambitious actor, and did not drink. But they were both married and feared catastrophic consequences for their careers if they divorced. They appeared before huge crowds together on tours promoting war bonds for World War I, but they always managed to hide their relationship from the public. Finally, Pickford and Fairbanks decided to risk everything: they divorced their spouses and were married privately in 1920. The public received them with open arms. It seemed like the perfect match: the union of America's most popular stars. For millions of adoring fans, they seemed to be royalty, living out a fairytale romance in a lavish Hollywood estate dubbed "Pickfair." The couple made headlines again when they joined with Charlie Chaplin and D.W. Griffith to establish United Artists in 1919. Never before had filmmakers taken so much control over the business side of their productions. 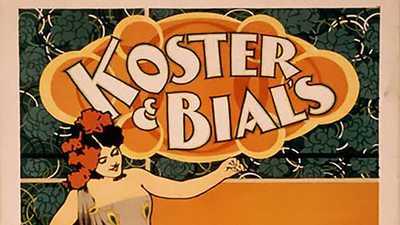 The company was created to distribute the founders' films, eliminating the distributors' stranglehold on profits. "The satisfaction was, in one word, freedom. It's a heady wine, and having tasted it, you find it impossible to go back to working for someone else," Pickford would admit. Capturing a bigger piece of the pie might have been sweet, but in the years to follow, the financial demands of United Artists would pressure Pickford to limit herself artistically, playing roles she knew her fans would love. In 1920, Pickford played Pollyanna. The movie grossed an impressive $1.1 million (more than $10 million today) and further solidified the little girl persona Pickford's fans loved. Over the next decade her characters would grow older, and her roles more demanding. The films she did for United Artists in the Twenties were enormously successful, as the nation emerged from World War I, women won the right to vote, and Americans shed Victorian morals in the modern, urbanizing Jazz Age. 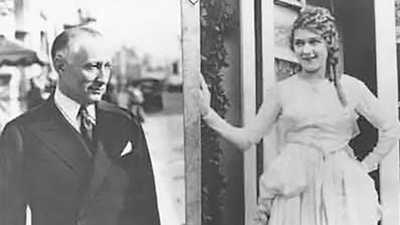 In 1928, Pickford's mother died of breast cancer. In her grief, Pickford cut off her famous curls -- and was lambasted by her fans. "You would have thought I had murdered someone, and perhaps I had, but only to give her successor a chance to live," Pickford would reflect. But she knew she could not continue to play teenagers; her age was beginning to make those roles less credible. In addition, the silent era was coming to a close. Pickford was the first major star to attempt a "talkie" -- a movie with synchronous sound -- but the results were disappointing. The technology was still cumbersome and she faced challenges at the box office from glamorous new stars like Marlene Dietrich and Mae West. At the same time, her husband was straying. Fairbanks's own movie career was slowly sinking as well, and he had become interested in a British socialite, Lady Sylvia Ashley. Pickford was wounded and betrayed. When the film that would be her last, Secrets(1933), lost money at the box office, she sensed her career was over. "I've worked all my life," she said. "Work has become my life. I can think of nothing to fill the void." 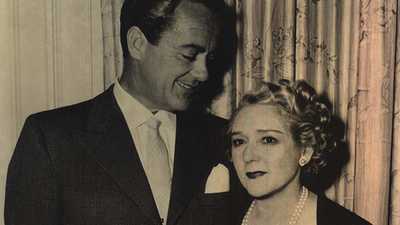 In 1936, Pickford divorced Fairbanks, and a year later she married her co-star from My Best Girl (1927), a younger man named Charles "Buddy" Rogers. Pickford's feelings for Fairbanks were still strong, but Rogers had proved to be a loyal and devoted companion. The couple adopted two children when Pickford was 51. Professionally, Pickford tried her hand at radio, wrote for magazines, and engaged in philanthropic pursuits, none of which were particularly successful. Her fall from fame left her unfocused and adrift. Pickford turned to drinking. Pickford's last years were spent at Pickfair, in seclusion. In 1976, over four decades after Pickford's last performance, the Academy presented her with a lifetime achievement award. She was too frail to attend the ceremony, so a crew came out to Pickfair and taped the presentation. Audiences were stunned, even offended, to see how much she had aged. She died three years later, at the age of 87. Pickford was the world's first international superstar. Her performances could be seen and admired anywhere, thanks to a new, portable, mechanically reproduceable art form. Pickford was the first to experience the glamour and excitement of enormous and extravagant fame — and the first to pay the price for its loss. In 1915, statisticians calculated that she was seen globally by 12 million people every day. At the height of her success, she was the richest woman in America — and she enjoyed a long career in front of the camera. By the late 1930s, her star had waned. Still, Pickford's contributions to the development of film — the major artistic invention of the twentieth century — make her one of the most important cultural figures in American history.